„I stand before a fog that wraps the world around. Ahead of me lies the path of passion and change and within me the courage to cross it. I will change myself a thousand times before I return to the place from which I started….” This is how the path of change and transformation begins. Conscious path. 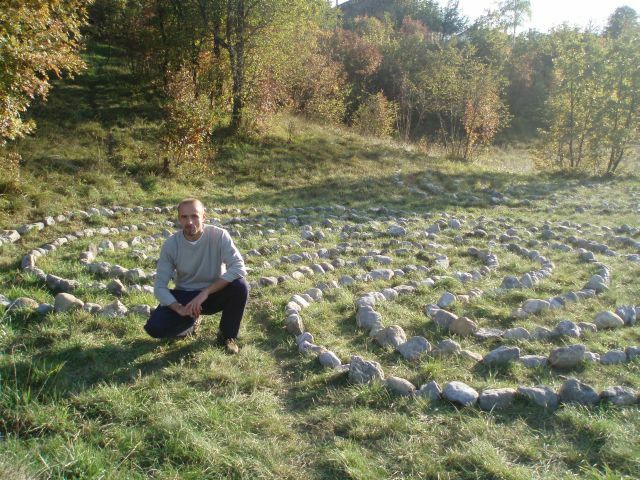 It is symbolic…Damir Kruljac continous to build labyrinths in the vicinity of town Rijeka. Soon, there will be whole new city of labyrinths built on the meadow. For time being, four of them are completed. Read more about an interesting experience he had with the labyrinths. Very thick fog came over Grobnik that Friday. I don’t remember seeing a fog that thick here. Symbolic, again, but at the same time it is a sign of synchronism because today (that Friday) I am opening the labyrinth of transformation. Fourth in a row among labyrinths I made on the nearby meadow. The labyrinth of transformation is unusual. It’s enough just to see it and one can immediately know that it is much different then other labyrinths. 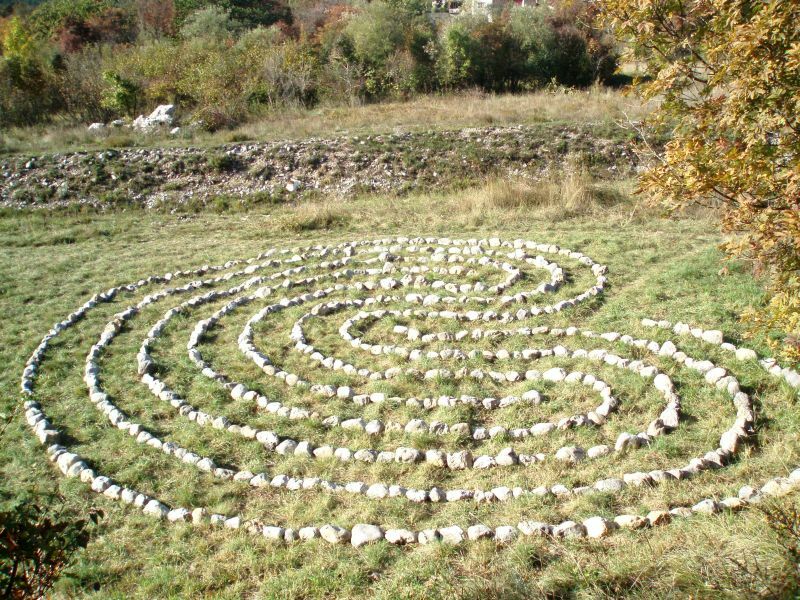 There are two possible ways to enter, one towards the center and the other leads left through outer path of the labyrinth. The author of the labyrinth says that such symbolism indicates the relativity of physical world. There is no fixed center. That makes it interesting. Nevertheless, none of these things make the labyrinth of transformation less powerful then other labyrinths. It is, in fact, very powerful. I realized that as soon as I constructed the seed form. Which immediately began to radiate with some magical attractivness and beauty. It came as a surprise to me. I didn’t expect it to be so beautiful and so precise. It took me three days to build it. Of course, I used rocks from the nearby creek. I build it all by myself. It just felt right to do it alone. The only company I had were animals. Unlike us humans, they seem to have some extra sensory perception so they are always present when I build the labyrinths. This time dogs were my regular guests. There were also some cats and birds but dogs seemed to like this very much. An interesting thing happened just when I finished the construction. I put last rock on its place and in that moment a couple of dogs came out of the forest. A male and a female. They elegantly came to the labyrinth, sniffed around, including me and then returned to the forest. It was very interesting. By the way, last rock I used for construction was animal shaped, kind of a dog shape. That is another coincidence because the labyrinth of transformation has lot to do with animals. In fact, it is their guardian in a way. I made the opening ritual Friday afternoon when the fog dissapeared. Luckily, the ritual text is a very simple so I had no problem memorizing it. It is a simple yet a powerful text. Tommorow the labyrinth had its first walkers. It began to do its duty. That made me happy. 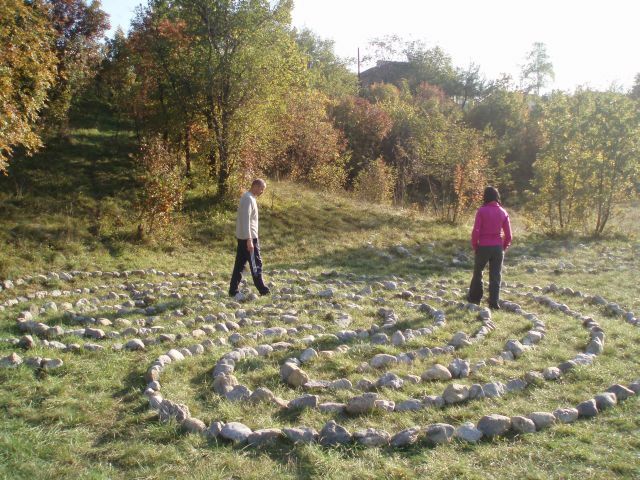 I must say that the labyrinth functions when it has people’s attention. 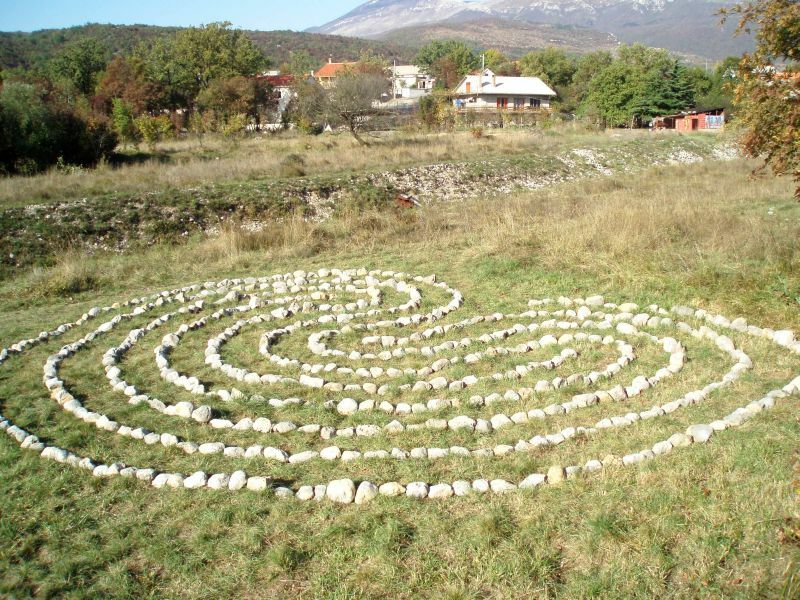 The labyrinth of transformation, in my opinion, is one of the most important labyrinths or better said, one of the most needed in this moment. It is perfectly clear what is going on with our world and our society and I wouldn’t say wrong if I say that the most important thing right now is a change, a transformation. A change from within, the inner change, but also the change that can be seen, like the way that we live and relate to others and the planet itself. Leaving old beliefs and accepting new ones. Such shift still represents a problem for most of us or we just don’t think about that because we are satisfied where we are. And most of us are enjoying our “comfort zones” and we seem to stop progressing or we just go in the wrong way. Most of us feel stuck and powerless to change. I know that from personal experience because I myself am stuck in a such comfort zone. 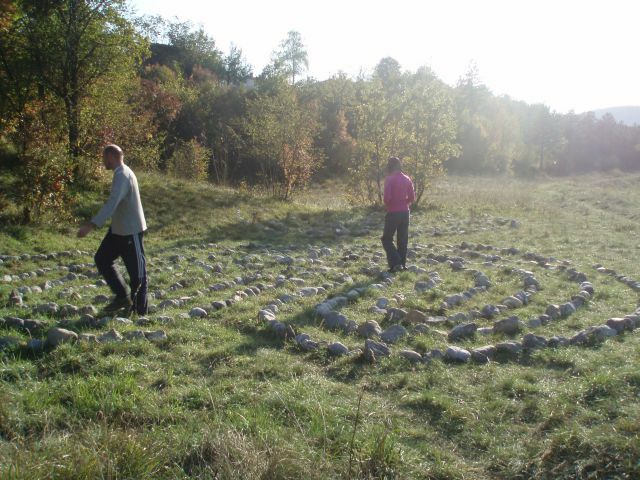 Having that in mind it can be said that the labyrinth of change is the most needed labyrinth right now. Abandon the old to gain new. Transform old bad to better new. Be courageous and passionate! Change! And now I want to share with you one of my experiences with the labyrinths so far. I use four of them. They are all together on a meadow. And they are getting stronger. I want to write about the night I walked during the full moon. It was the first time since the labyrinths are built that the full moon casted its light entirely on all labyrinths and it wasn’t late in the night. I didn’t want to miss that. It was about 10 PM when I entered the labyrinth of feelings just in time to be in its center when the moment of full moon came. The experience was very strong and intense. My body started to shiver like a tree branch. The energy I felt was very strong and powerful. But I came out alive and well. I have been regularly walking through the labyrinths for some time lately. And what can I tell you?! To be honest, there are more and more moments in my life when I feel “exalted”. I think that is the right word to describe the feeling when everything is in place and everything is ok and you are not alone here. Of course, in those moments there is no worry, fear, anxiety or other negative feelings. There is only happiness. Here and now! Such moments don’t last long but they are more and more present in my life. So, dear readers, walk through the labyrinths! Greetings to all of you labyrinth lovers!